Tim and I also found it to be quite a pain to tie 8 ties every time the kids all helped and to then tie four ties again once they were finished so the aprons could be hung on a hook by the neck straps. 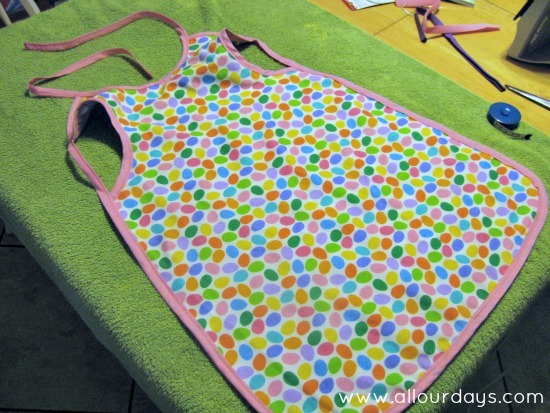 This full-coverage apron is simply a longer (and slightly modified) version of my favorite bib. Now that we have a full set, we only need to tie four neck ties and once the kids are finished the aprons can be hung up by the armhole strap without any retying. Would you like to see how I made them and how you can make your own? Fabric: I used a combination of cotton and flannel fabric. The flannel adds some absorbency to the apron in case of spills. You’ll need approximately 2/3 yard of each fabric. This amount should give you enough wiggle room to account for any shrinking. Make sure you wash and dry your fabrics before beginning. Extra Wide Bias Tape (1/2 inch wide double-fold): two pieces @ 11.5 inches, 1 piece @ 74 inches, and one piece @ 40 inches. The store-bought bias tape is a total of 1.875 inches wide so if you’re making your own you’ll want to cut your strips that wide. Here’s a super simple printable you can use to make your own bias tape folder. If you’re buying packaged bias tape at the store you’ll need two packs like the ones pictured below. *Please, feel free to spread the word about this free pattern, but do not host or share the pattern file in any way. Simply share the link to this post instead. Thank you! 1. 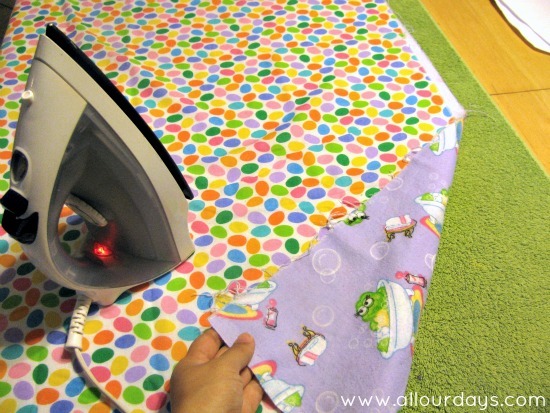 Start by ironing both of your fabrics and placing them one on top of the other with wrong sides together. 2. Now fold both fabric over (keeping them together) just enough to fit the pattern piece. 3. At this point you could pin the pattern piece down, but I simply use some small objects as weights and cut around the pattern. Make sure you’re cutting through all four layers of fabric. 4. Open the folded fabric back up so it looks like this. Your fabrics will still be wrong sides together. 5. 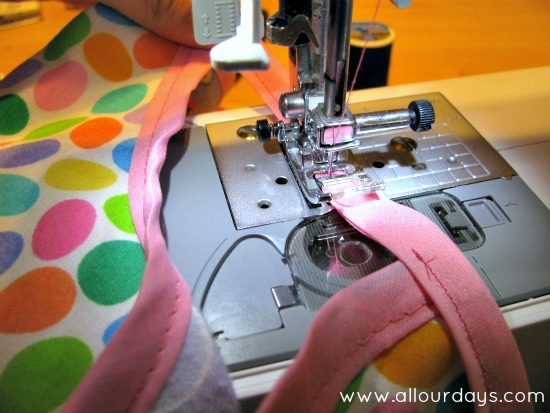 Pin both fabrics together the whole way around the apron and use a long straight stitch to baste the front and back of the apron together close to the edge (about 1/8″). 6. Use the two 11.5 inch pieces of bias tape to enclose the raw edges of both layers of the arm holes together. Both fabrics will be sewn inside the bias tape. 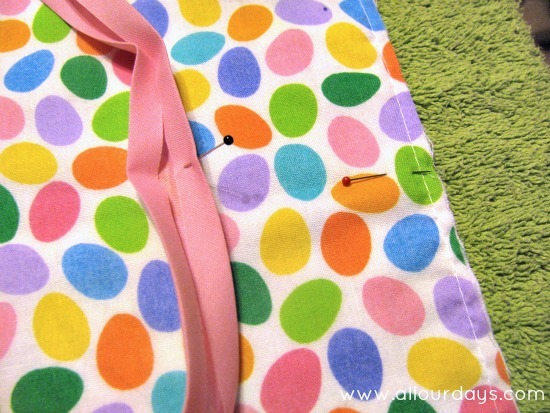 Sew around the arm holes, close to the edge but making sure to catch the underside of the bias tape in your stitch. 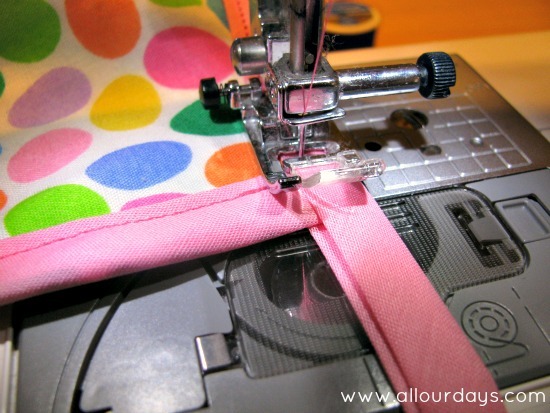 For more details on one-step bias binding go here. 7. Starting at the corner where the neckline and shoulder meet, attach one end of the 74 inch bias tape to each shoulder. Make sure the bias tape doesn’t get twisted. 8. Find and mark the middle of the body bias tape and the middle of the apron body by folding each in half. 9. Line up the middles and pin together sandwiching both layers of fabric in between the bias tape fold. 10. 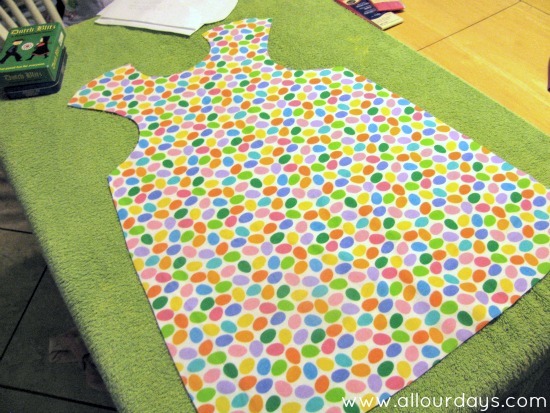 Starting at the middle point at the bottom of the apron, pin the bias tape along the entire body of the apron. Once you get to the armhole binding continue pinning the bias tape to itself as you continue towards the shoulder. Pin the other side as well. 11. 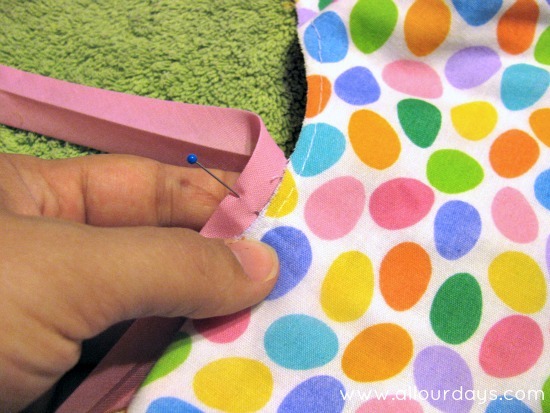 Begin at one end and sew the bias tape to the entire edge of the apron body. This is what the apron should look like at this point. 12. Grab the piece of 40 inch bias tape and finish off each end. 1) Open the bias tape one time. 2) Fold the corners down at 45 degree angles. 3) Fold that entire point down. 4) Close the bias tape along the original fold. 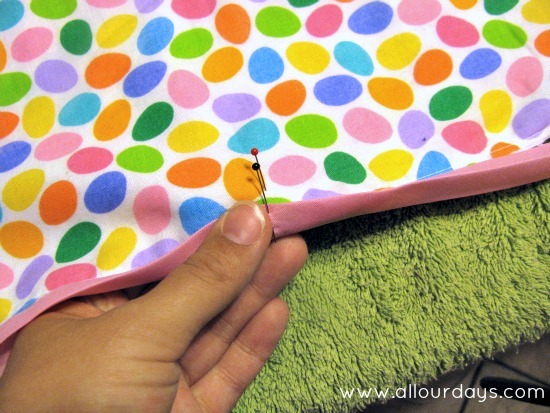 5) Sew across the ends making sure to backstich to keep your stitches in place. 13. 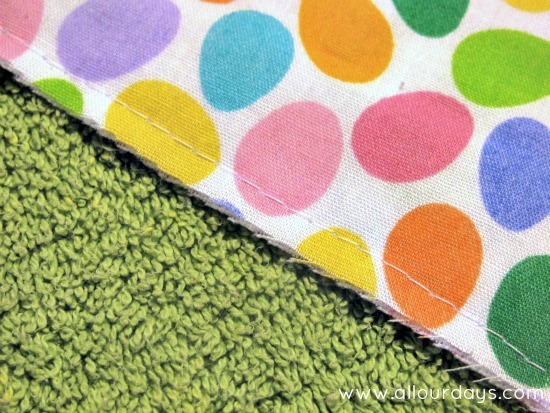 Fold the bias tape in half and mark the middle. 14. 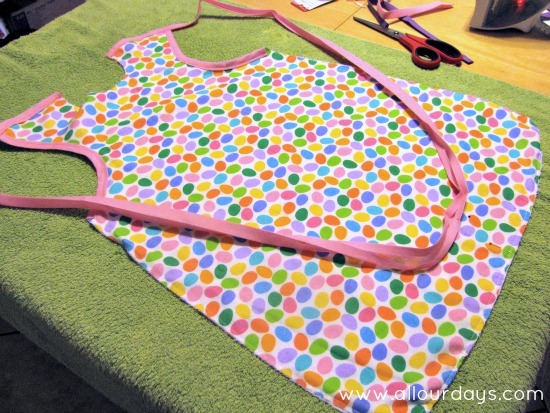 Fold the apron in half to find the middle of the neckline and attach the middle of the bias tape to this spot. 15. Pin the bias tape to the neckline and pin the bias tape to itself to form the neck ties. 16. 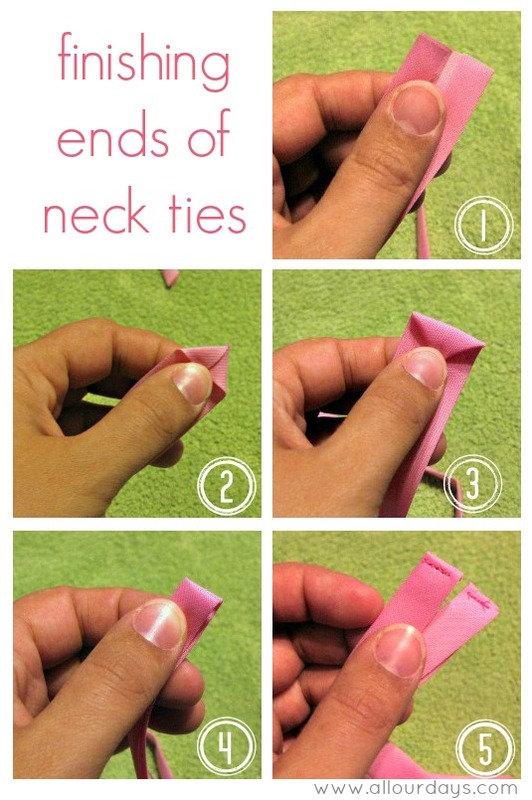 Sew from one end of the neck ties to the other end. Do you have any questions about the process of making these aprons? What little one in your life could use a new apron? I can’t download the file . Please can you email it to me ..Thanks, it is a great idea. Can’t open the pattern for the full length, says the fale is damaged and can’t be repaired. Thanks so much for the free pattern and the great tutorial. I will be making aprons for my g-kids. I cannot get to this pattern and it is sooooo cute! I clicked on the blue “Full Coverage Child’s Apron Pattern” under the black heading of “Matching Thread”, but it doesn’t take me anywhere. Maybe try it in a different web browser. If that doesn’t work, let me know and I’ll email the file to you. 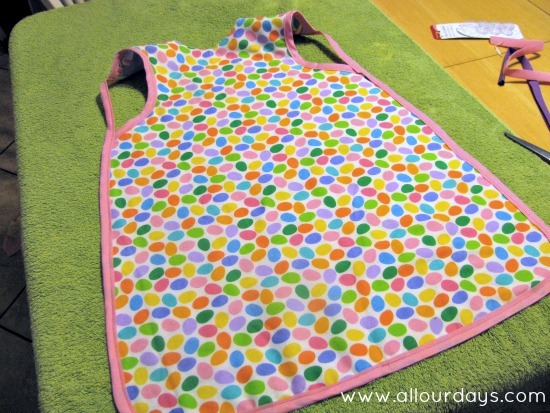 Hi…I love this apron/smock/bib…this will go a long way in making me an even happier grandma. I’m a neat freak and hate their clothes getting messy…however I do not stress it if they do. But there will be a lot less laundry. I only with the instructions were in a printer friendly format, it would have been much easier to obtain. 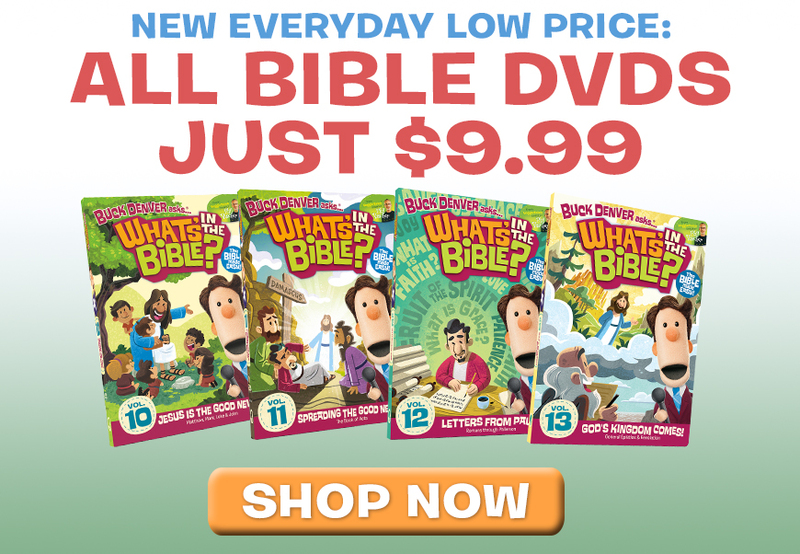 Printing in this format makes it print out 14 pages which include all the “ads” on the sides. Sorry about that. I’ll look at making a printer friendly version when I get some extra time. Love it…very cute..thanks for sharing….love that there is only the neck to tie…thanks…. I have a question. When putting the patten pieces together, how should they be overlapped: By 1. Placing the solid line of Piece 1 on top of the solid line of Piece 2, or 2. Placing the diagonal lines of Piece 1 so that they line up with the solid line of Piece 2? I think that the solid line of piece 1 should line up with the solid line of piece 2, but I want to be sure since this will affect the length of the apron and consequently, the room allowed for the armhole opening. I would appreciate your response. Thank you so much. Sorry for the confusion. Match up the pieces on the solid lines. I found and made this for my 2yo today. She is obsessed with pockets so I added 2 with a little rick rack. It came out very cute! Thanks for the pattern and tutorial! If I make one for my son …. he’s 6 years old … would this work? I made one for our 6-year-old daughter and it fits wonderfully! Love this!! Thanks for sharen with us at One Sharendipity Pl. this weekend! My business website has nothing to do with sewing other than allowing me time to sew by not having to leave home to work. Thanks for the fun pattern but I needed 2/3 yard which will make two but with only 1/3 yard I had to seam the middle of the front and back pieces. So sorry for my typo. I’ve updated the tutorial. I hope you enjoy the aprons. These aprons are so cute and beautiful!! The link for the bapron is not free. Do you have the free version and are you allowed to share it? 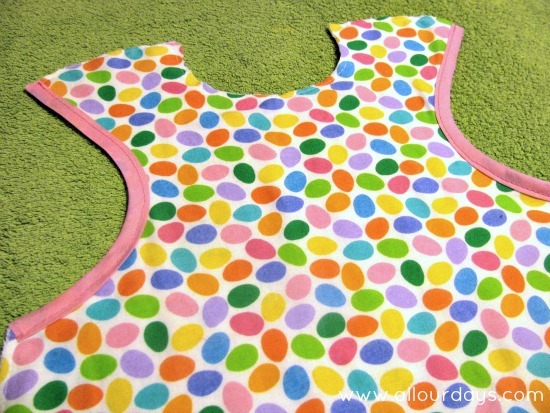 Do you have any idea how to resize your free printable pattern into the bapron size? Those are perfect!! Pinning for later! We think they’re quite wonderful, too 🙂 Our kids want to wear them all the time!